What a perfect way to commence my new refreshed blog. 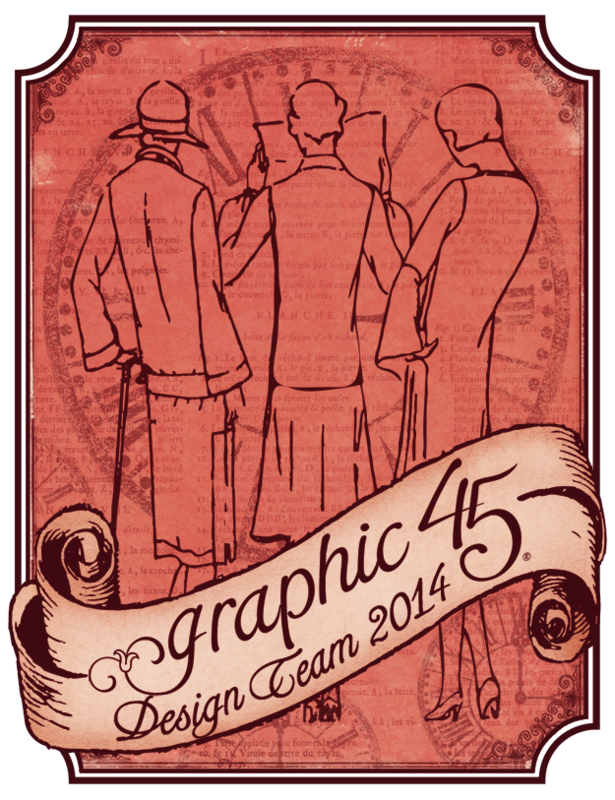 Graphic 45 is a company that inspires my creativity. The vintage inspired designs and imagery have been a core of my designs over the last year. I have been utilizing as many different collections as I can. Choosing which to use first is always a challenge as they have so much to offer. I hope you will enjoy discovering my creations using the wonderful collections I have chosen. This collection has a wonderful colour palette, it inspired me to create a book box that I felt went so well with the theme of the paper. I home school my children and would love to use it for memories of their activities. I have a serious sweet tooth so when I saw this collection it was a given that I would love creating with it. Gift giving is a wonderful thing to do, so I hope this gift bag I have created will inspire your gift wrap this christmas or your next special date. Cards are great way to use left over papers that you really love and then send on to those who are special to you. These two cards are very crisp in design and the steam punk cards is a shaker card with mini cogs. This collection is so cute. In my house hold it has created a lot of excitement. My daughters all love it. I have created these tags to demonstrate the versatile nature of graphic 45 papers. The fairy theme is so wonderful and I love the gentle colours. My word to describe steam punk is industrial, and very very cool. 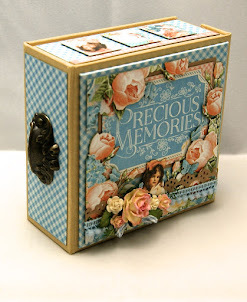 I have created this project to store my metal embellishments. It has so much scope for design and I love how it works as a terrific masculine themed collection. The colours are truly vintage and blend so well together. Place in Time is a collection that is a wonderful compilation of fabulous images. The project I have created is a perpetual class I am teaching. We have currently completed the album construction and the first three monthly layouts. It has a great number of specific themes for each month. Ladies diary collection is so feminine. This trinket box is a piece that would be a stylish addition to a mantle or ladies dressing table. It also has the capacity to hold three mini photo albums. Christmas is a time of year that brings happiness and fun, this set of four decorations give a sweet whimsical feel to the holiday season. I love the fussy cut images and bold colours. They take pride of place on my christmas tree. This project is has been created from my all time favorite graphic 45 collection thus far. It represents my children aged 18 months to 3 years. I love this everything about this collection. It is representation of my layout style and I hope it can be an inspiration to others. This was a fun project to create. It has wonderful fantasy feel about and I love every view, there is so much to see. It was created using a wooden fibre board birdhouse and the wonderful collection really bought it life. The cape cod on the top was a chip board construction I added to give it more dimension. There is so many positives about the birdsong collection. I love its depth and strength of colour. The box / album combination gave me the opportunity to show case this wonderful collection and the asian images are so beautiful. I hope you have gained some inspiration from my creations and I have shown a little of my love for scrap booking and the paper craft world. Please leave a comment if you like and come back and visit again soon . I would like to thank graphic 45 for giving me the opportunity to use their wonderful paper collections and I look forward to using other products from them . I hope I have the opportunity to expand on three of my projects if I am successful and would like to wish all the applicants best wishes in their scrap endeavours. Andrew, you are such a talented scrapbooker. I love all your work. Amazing work :-D Good luck with the G45 Design Team application!!! Great projects! Good luck to you. Wow Andrew! These are stunning creations and if you don't get on the team I really don't know why.. You use these papers wonderfully, fussy cutting the intricate designs perfectly.. I do wish you well in your DT application.. but seriously these are awesome and very inspiring creations.. I really love them... p.s. I have come here via scrapNpatch email newsletter and have also become a follower, so I hope to be back to see what you are up to!! Fabulous work Andrew and hope you make the team!!! Hi Andrew. I'm just stopping by to say what an inspiration you are and G45 would be lucky to have you. I'm really looking forward to hearing the news. All your creations are wonderful! A preference for the Ladies Diary: Altered Trinket Box and Bird House. You do amazing work! Congrats on making the first 30!! Beautiful stuff! The altered box and birdhouse are gorgeous :) Congrats. WOW!!! I am in love with your work!!! Soooo insanely well done!! Such great detail..I KNOW they BETTER pick you for the team and to never leave!! Great style and love that box with the lace on it and the birdhouse...crazy awesome!! Good luck!!!! Such wonderful work. Congrats on making the top 30 finalists. Best of luck. Congratulations! It's really cool to see a guy in here. You did a great job with your projects. Andrew, Congrats on getting into the final 30!! Just had to leave a msg and say how much I admire the work you have shown here. Nice to see an 'Aussie' in the running for the design team!! I did want to ask if you would mind dropping me an email when you had the time as I wanted to ask you a few questions and didn't really want to do it on here. Thankyou for sharing such beautiful and inspiring work!! Congratulations Andrew! I can certainly see why they picked you. Your work is phenomenal! I kept picking a favourite until I looked at your next creation and then that one became my favourite and on and on like that. I loved looking at your work, thank you for sharing it with us. I have subscribed to your blog so that I can watch for your next creations! YAHOOOOOOOOOO!!!!! CONGRATS TO YOU ANDREW!!!! AMAZING WORK!!! YOU ROCKED IT!!!!! MOVE OVER TIM HOLTZ! A new designer is in town! Love love love the metal trinket box. Must recreate! Your altered items and your mini books are FANTASTIC! Best of luck and congrats for making the top 30! Your page LOs are so nicely done! It was fun to look closely at each section. Beautiful...good luck getting on the G45 design team! Congratulations on making the top 30, very much deserved! This is all so stunningly crafted! Good luck in the next round. Andrew! Wow, congrats on making the top 30!! Your work is AWESOME!! Best of luck to you!!! Congrats Andrew. I've never seen your work before - it's sensational! Good luck for the final selection. Congrats Andrew - great to see a couple of Aussies in the top 30. Your projects are just wonderful. The best of luck for the next round. Fingers crossed. they are all gorjus creations!!! Congratulations Andrew on making it to the final 30! Your projects are wonderful. Good luck to you. Congratulations on reaching the 30, and good luck in the next round! Congratulations Andrew on your place in the Graphic 45 top 30 - I can see why you're there and look forward to seeing more of your beautiful creations.I remember chatting to you on Laura's show once about the unavailablitly of chipboard here. I live in Caloundra on the Sunshine Coast,Qld. Gorgeous Work Andrew! Congrats on making the top 30! Woot! Gorgeous projects!! Don't know how you do it!! Good luck!! Gorgeous work!!! Started to following you, amazing!!! Thanks AnnMarie for your lovely comment. The project 5 drawers, the out side box component I made from chipboard and the drawers themselves are tim holtzs configuration boxes. The birdhouse was a wooden one I had in my stash. The birdsong project was a box I saved from something I bought. Ladies diary and abc primmer projects were completely constructed by me using chipboard etc. reading your profile and I was amazed to see that you are from Luton, Bedfordshire..... I have been researching my family tree for many years and my Dads side of the family are from Tempsford, Bedfordshire, a few of them came from around the Luton area also. And I also see that you live in Toowoomba now which is where my Mums side of the family first settled (Erbacher) long time ago lol... good to see that you have made Queensland your home...following your blog now, you are one very talented man. Stunning work Andrew. 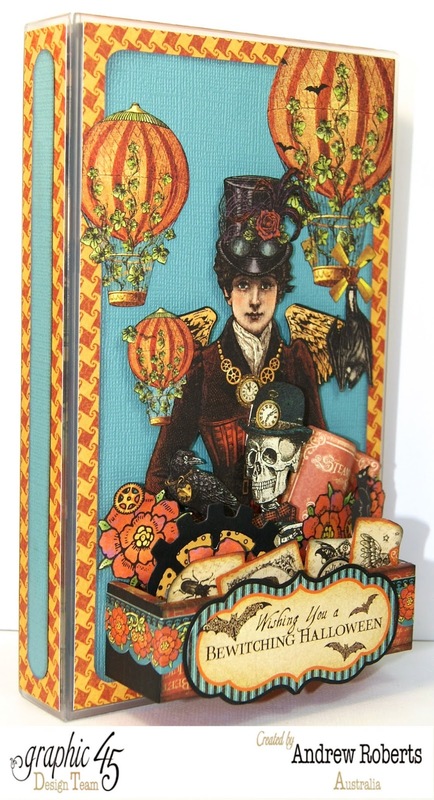 Especially love the ABC Primer Box and Steam Punk embellishment drawers. Karen.